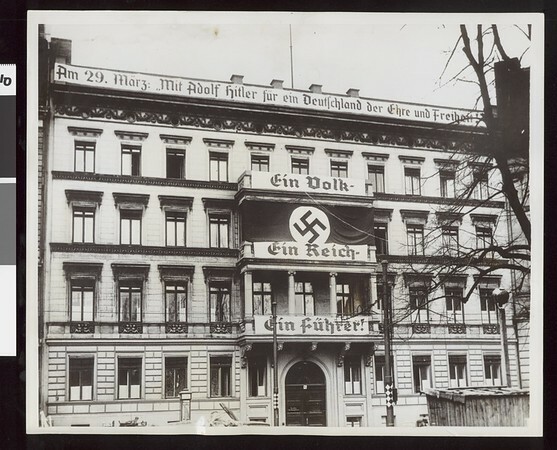 Photograph showing Nazi propaganda signs on a building in Berlin, Germany. "KY757797 ... Watch your credit... International News Photo | Slug (propaganda) | "One people, one Reich, one leader" | Berlin, ... The signs on this building were typical of other building decorations in the patriotic fervor that accompanied the preparations for the plebiscite. Adolf Hitler sought the backing of the people for his stand in re-occupying the Rhineland. And the results were most gratifying to [...] Fuehrer [sic]. Over 98% marked "Ja" on their ballots. Members of the Nazi Party were actively engaged in seeing that all well persons could get a chance to vote. The signs on the building read (from third floor to first) "One people", "One Reich" and "One leader". (E-4-1-36)" -- typed note attached to verso. "Received. Examiner reference library. Apr 7, 1936" -- stamped on verso.